Welcome to GiGi’s Playhouse Phoenix! GiGi’s Playhouse is a one-of-a-kind achievement center for individuals with Down syndrome, their families, and the community—providing free therapeutic and educational programs that advance literacy, math skills, motor skills and more. To see a world where individuals with Down syndrome are accepted and embraced in their families, schools, and communities. 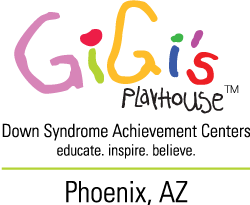 Sign up to receive GiGi’s Playhouse Phoenix updates, special events and other happenings around the playhouse.